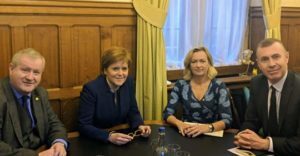 From WalesOnline: Plaid Cymru leader Adam Price met with Scottish First Minister Nicola Sturgeon as their parties work to come up with an alternative to Theresa May’s plan for Brexit. Mr Price argues that the two-year process which is due to see the UK leave the EU on March 29 regardless of whether an exit deal has been agreed should be extended. He hopes this could pave the way for a second referendum or continued membership of the EU’s single market.